My Journey to Fit: WWU - 9 Rainy Miles! WWU - 9 Rainy Miles! Me, Becky, Amy - three soaked, but accomplished, runners! It's week 14 of our half marathon training, which meant that we had 9 miles on tap for our Saturday run. I hadn't run this far since January, and after my brutal 8 mile run a couple of weeks ago, I was not really looking forward to it, especially since the weather had warmed back up. Not only were we looking at warm temps, but it was super humid...and then, rain came into the forecast. Ohhhh joy. As it turned out, thunderstorms also entered the forecast, so we went to bed Friday night not knowing if the run would even happen - we will run in the rain, but thunder and lightning? No way. Well, we woke up and it was dry, but checking the weather radar, we could see a line of green (rain) heading our direction. No word on thunder/lightning, so Jeff and I went ahead and set out the water and Gatorade along the route for our runners. We started our warm up walk - it was muggy and warm! Got to the half-mile point and whoosh - the front was here, in the form of wind and cooler temperatures. By the time our runners arrived at the park, it was starting to sprinkle...but we weren't hearing any thunder, so we decided to go ahead and run, cautioning everyone to turn around and get back to the park if they heard thunder. I started off with Amy and Becky, with Diane running near us - she doesn't do intervals but keeps about the same pace as we do with them. Sounds odd, but different runners, different strides (she's quite tall), and it shows how everyone does what works for themselves. Anyway, as we started running, it started raining. We were about one mile in when it began absolutely pouring! All I could hope for was that I'd used enough Body Glide to prevent any unfortunate chafing incidents. At least it was still fairly warm, so we weren't getting chilled - that would have been really bad. Funny story - during the worst of the downpour, Becky and I were running in the street while Amy and Diane were on the sidewalk. I think it was Amy who yelped - I looked over to see that the automatic sprinklers had turned on and not only were they getting wet via the rain, but the sprinklers were hitting their legs pretty good. It was like they were in a car wash, getting sprayed from all angles! Ahhh, running adventures make for fun memories. I didn't run in circles, but I did run past my group until I hit 7 miles! So here's the weird mental thing that happened when I restarted my Garmin. I knew that I already had two miles done, but whenever I would glance at it and see, say, it reading that I just hit mile four, I'd think "oh that's not too bad" - and continue on. Mile five? I was fine. Even when I hit mile six, I still wasn't thinking "OMG I'VE RUN EIGHT FREAKING MILES AND I'M STILL NOT DONE" - nope. Apparently I tricked my brain with the two "secret" miles and I never got that feeling of "I can't do this" - it really was strange...but in a good way. Soaking wet and tired after running 9 miles (or 16 miles as was the case with Fred and Brian), but still having a good time. 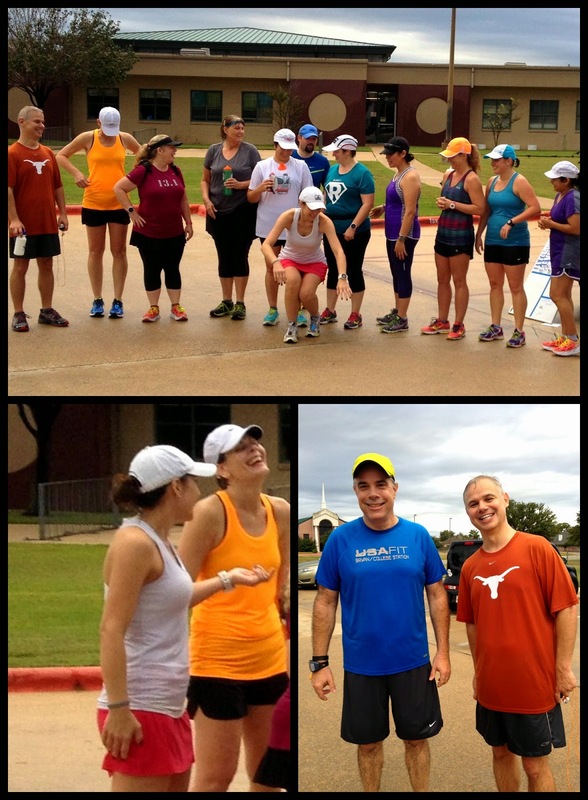 I love my running club peeps! Why YES, that is a full cinnamon twist on my plate! Jeff and I each got our own. Nine miles deserved that kind of treat. I got all the food, but had a hard time eating it. Jeff whipped through his meal and at that point I think I had finished my chocolate milk. When we run a lot of miles, my stomach doesn't feel great and it takes me a while to feel like I can eat, even though I want to. I picked at everything over the course of the 90 minutes we were there. I finally managed to finish the cinnamon twist, but Jeff kept eying it and I thought I was gonna have to take him out, ninja-style, if he made a move toward it! P.S. I'm happy to report that I had no chafing, which I think was a first for a rain run - hurray for that small miracle! I guess the trade off was my hair; I had the biggest rat's nest in it after that rain run - ugh. Tons of conditioner and leave-in detangler and it still took me forever to come it out. Guess I should try braiding it next time? I admire your dedication to your sport. I'm a big baby and I don't run in any kind of inclement weather. Of course, we are the lightning capitol of the world here in Florida. Good job on getting r done! Been there, done that many times. Funny, but if it's not cold and I've remembered to wear a hat to keep the rain out of my eyes, I really don't mind a rainy run. Absolutely amazing that you didn't have any chafing! So glad you had a great run - maybe secret miles is the trick? So proud of you! And I enjoy you running group so much, you can see how much fun you all have by the last photo's. And what does it matter if you play brain games and it gets you to running 9 miles. Do what works for you. I don't mind running in the rain at all but I do mind starting a run when it's raining, so much harder to get out there. And I don't run with thunder and lightning either. Thanks, Fran! Now I'm wondering if I should try that Garmin mind-trick this Saturday??? Wow, that is such dedication--running that far in the rain! I will still walk in the rain, but that involved holding a very large umbrella over me! Yammers? What was I trying to say this morning? 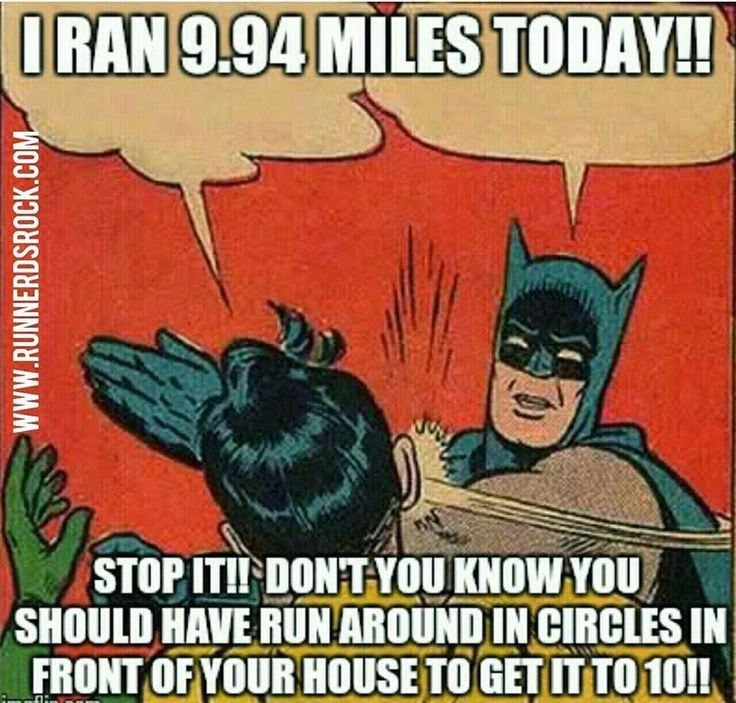 You should reset your Garmin every few miles to get that feeling. I am the opposite. If I think we are riding 40 miles - I feel so much better when I see mileage in the 30s and know the homestretch is there! If it were reset I would be bummed at how far I had to go LOL! I would love to see a photo of your hair in a braid! That was some pouring rain there for a while. It was actually stinging. My hair was so tangled and knotted too! I had to laugh at the other pics you posted at the huge frizz ball I was sporting. Note to self....braid hair for next rain run! Ahhhh....the cinnamon twists.....was my absolute favorite when I ate doughnuts. Sadly, they give me horrible indigestion now. I looked at those pictures and we had similar hair messes happening! Running in the rain sounds kinda awesome to me!! My daughter used to rave about Blue Baker! I would karate chop my husband too if he was eyeing my cinnamon twist! My step-son would love that - he's all about the cinnamon. Great job on running in the rain! There is a BB in Austin - wonder if it's near Joe?